33/400 White CRC (Child Resistant Cap) with .040 Foam Printed PS22 Liner. Please note that these will NOT fit our 75cc AMBER packer bottles because those are "Hinge-guard" type bottles. 50 cc (1 3/4 oz.) 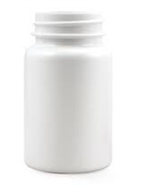 White HDPE Vitamin Packer Bottle (33/400). Dimensions NOT including cap: 2.75" Tall X 1.5" Wide. PRICE INCLUDES: White Foam Lined Self-Sealing Child Resistant Cap OR White or Black Fine Ribbed Screw on Cap with F217 Liner. 75 cc (2 1/2 oz.) 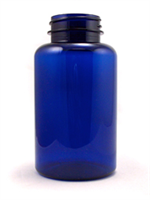 Cobalt Blue PET Vitamin Packer Bottle. Dimensions NOT including cap: 3.25" Tall X 1.75" Wide. 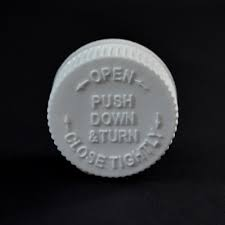 PRICE INCLUDES: White Foam Lined Child Resistant Cap, OR White or Black Fine Ribbed Screw on Cap with F217 Liner (33/400).